When Prometheus stole fire from the King of the gods Zeus and gave it to humans, humans were no longer afraid of the cold and slowly they started progressing. However, instead of being good people, they turned out to be bad and unfair. Furiously, the King of the gods Zeus one day decided to destroy the human race. But in Thessaly, in Central Greece, there lived the son of Prometheus, Deucalion, and his wife Pyrrha. Those people were good and righteous and Zeus felt pity for them and didn't want them to die. So he asked from Deucalion to build an ark. Deucalion obeyed, and when he built the ark and gathered all the necessary supplies, he entered the ark with his wife. Zeus then opened the heavens and it rained so much that all the land of Greece transformed into a sea. For nine days and nine nights, Deucalion's ark was wandering around, until finally it stopped at the top of Mount Parnassus. Suddenly, the rain stopped, and Deucalion with Pyrrha stepped out of the ark and made sacrifices to thank Zeus for saving them. But, obviously, they were very sad and cried, because the world they were now living in was lonely... Zeus felt sorry for the couple, so he sent his messenger Hermes to grant them a wish. The couple asked for people. "Go back and throw stones", he told them and so they did. The stones that Deucalion threw became men and those of Pyrra became women . This way, once again a new race of men was created. 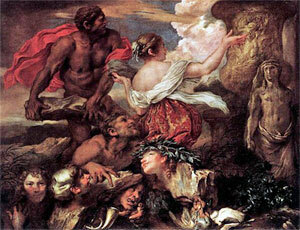 The first stone thrown by Deucalion became a man called Hellen (Hellinas). According to the legend, from Hellen and his descendants the Greek people (the "Hellenes") originate.